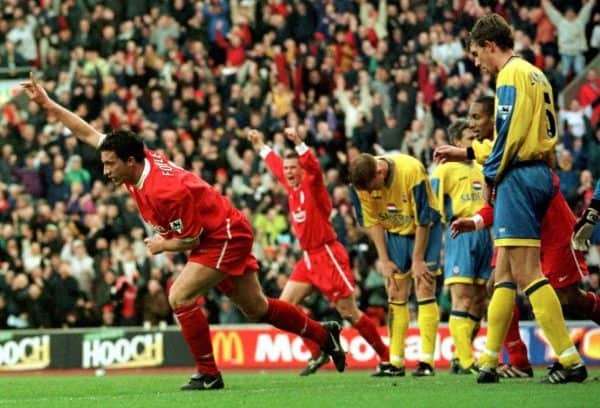 It’s 20 years since Liverpool recorded their biggest Premier League victory, demolishing Southampton at Anfield with every goal scored by an academy product. The 21st century has seen plenty of ups and down take place at Anfield, with success and disappointment both coming Liverpool’s way. 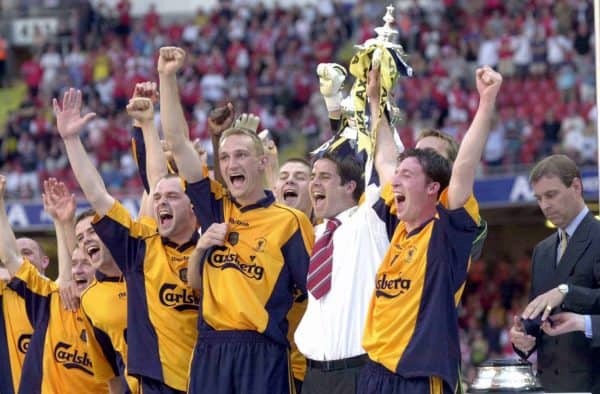 The Miracle of Istanbul, cup treble under Gerard Houllier and table-topping form of Jurgen Klopp‘s current side all stand out as happy periods, but the doomed ownership of Tom Hicks and George Gillett and the Roy Hodgson era are low points in the club’s history. Just prior to the turn of the millennium, the Reds picked up their most conclusive victory since the Premier League‘s inception in 1992, with the record still intact today. As we reach exactly 20 years since that emphatic afternoon on Merseyside, it would be rude not to take a trip down memory lane. January 16, 1999, felt like a routine day at the office for Liverpool before kick-off, as struggling Southampton made the trip north. A 0-0 draw at Arsenal a week earlier had left Houllier’s men seventh in the table, eight points adrift of leaders Chelsea. Talk of a title win was fairly muted, with qualification for the Champions League for the first time Liverpool’s primary objective. At that point, only three English teams made it into Europe’s top competition, making it a tough challenge for the Reds. Their year couldn’t have been given a bigger early boost against Saints, though, as Anfield witnessed a demolition job of the highest order. Houllier opted for a 3-5-2 formation, or certainly something close to it, with a young Jamie Carragher slotting into the back-three alongside Phil Babb and Dominic Matteo. 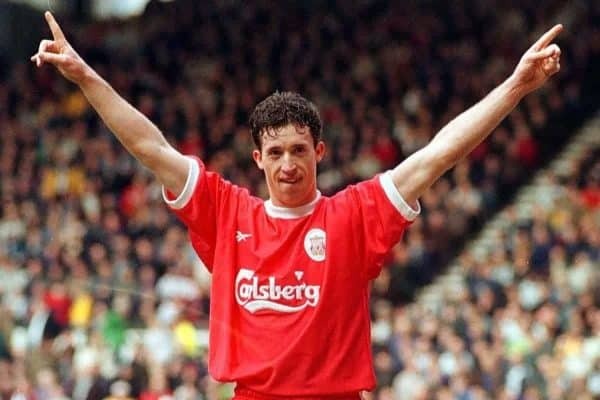 Robbie Fowler and Michael Owen started in attack – something Houllier often chose not to do during the aforementioned 2000/01 treble-winning season. It was Fowler who made the headlines on the day, as the Liverpool legend added yet another goalscoring feat to his scrapbook. The score was actually level until midway through the first half, when ‘God’ pounced on a fumble by future Reds-loanee Paul Jones to fire home in front of the Kop. Matteo doubled the lead with a header to score his first goal for the club, before a typically slick Fowler finish effectively put the game to bed before half-time. He completed his hat-trick soon after the restart, with Owen assisting his strike partner for a second time. The Anfield crowd may not have realised it at the time, but a real collector’s item arrived later in the second half. Carragher finished from inches out before wheeling away in delight – the second of just five goals he would score in 737 Liverpool appearances. Egil Ostenstad scored the most meaningless of consolations, only for Southampton‘s humiliation to be completed by Owen and young substitute David Thompson. It was an afternoon to treasure for those present and 20 years on Liverpool are still trying to better it in the Premier League. Surely this current side have a chance of breaking the record! It wasn’t meant to be in terms of Champions League qualification for Liverpool in 1998/99, as Houllier’s side disappointingly finished seventh. A total of just 54 points was achieved in 38 games – the Reds have 57 points from just 22 matches this season, which puts things into perspective hugely. Silverware also evaded them, with a heartbreaking FA Cup fourth-round defeat to Man United seeing that season’s treble-winners score twice in stoppage time to overturn a 1-0 deficit. It was just the beginning for Houllier, though, whose spell as Liverpool manager was still in its infancy, after taking sole charge following Roy Evans’ sacking. A fourth-place finish with 67 points was achieved the following year, before the memorable 2000/01 campaign, which saw three trophies won and Champions League football finally secured. The 7-1 mauling of Southampton wasn’t necessarily a sign of things to come in terms of entertainment value, with Houllier renowned for a more pragmatic approach, but it was undoubted proof of the progress being made. The question is: when will that record finally be broken? Goals: Fowler 22′, 37′, 47′, Matteo 35′, Carragher 55′, Owen 63′, Thompson 73′; Ostenstad 59′. Liverpool: James, Heggem, Carragher (Kvarme 79′), Babb, Matteo, Bjornebye, Ince (Thompson 73′), Redknapp, Berger, Fowler, Owen (Riedle 73′). Subs not used: McAteer, Friedel. Southampton: Jones, Hiley, Colleter, Lundekvam, Bridge (Le Tissier 46′), Howells (Oakley 62′), Monk, Kachloul, Beattie, Ostenstad, Hughes. Subs not used: Stensgaard, Dryden, Ripley.